Without a doubt, my favorite moments of mothering come with a picture book, a well worn blanket, and both girls sitting on my lap. A part of the personal joy comes with my secret love of reading aloud. It’s as if I take to the theatre, and at times, the girls are my most captive audience. I whizz and I clang, I crash and I bang, I moo and I baa with the best of them. Josie is at the age where she can really take in a story now. She wants to know where Miss Rumphius is going; she wants to hear why Mosquitoes buzz in your ear. Gracie, being so young, is eager to touch the pages of a book, interact with the binding and point at any dog on any page. When my girls are engaged in a book, so am I. In those moments, motherhood is everything that i dreamt for it to be. Our collective imaginations have taken flight thanks to the power of a book. You see, I dreamt of motherhood involving loads of reading because that’s so much of what I was raised on. My older brother and I were a team: the munchkins. As wee little ones, my mom would habitually grab her munchkins, take us upon her lap and read to us for what felt like hours. Physically we were in Los Altos, California. Mentally, we were on the shores of Ireland, in the desert of the Middle East, or hiking the Himalayas. Our world opened thanks to our mom and the books she would read to us. And while we were mentally traveling the world, we were actually in what felt like the safest place in the universe: our mother’s lap. 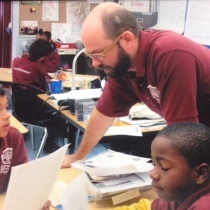 My brother, my fellow munchkin, opens the minds and spirits of little kids every day, teaching 2nd grade in West Oakland – a highly impoverished area. For many of these children, through the power of the reading, this is their first flight around the world. And for some, school is the place equivalent to my mom’s lap: it is their safe haven. Being the caring, sensitive man who my brother is, he wants nothing else than to help his students open their minds at the foundation of their youth and to help them to succeed in this mind boggling thing called life. My brother is succeeding because he’s an excellent teacher. However, he could use our help. He recently opened a Donors Choose page requesting more books for his classroom. He has no idea that I’m writing this post. But I thought we could help a brother out. Joe gives his students three opportunities every day to choose a book from their classroom library to read by themselves or with a partner. At the back of each student’s chair is a sack containing five books that they have each picked out at their own level. Just imagine how they must cherish picking those books out. Joe and the kids switch out their books twice a week. The catch is that they’ve read through all of their books. And while reading a book time and again has it’s comforting quality, there is nothing quite like reading a new book and sparking a new wondrous adventure. So, dear lovely readers, I turn to you. I’d ask that you consider giving a little to my brother’s fund here so he can fill up every corner of his classroom with books for his kids. Thanks so much for your donation, Ann! Thanks, mom! Twice over…for the donation and the years reading to us! Kate, I will donate today! I didn’t know your brother was a Teacher. After 27 years teaching K thru 12 I have great appreciation for his calling. Here is a quote I used w/ my 5 year olds to celebrate Mother’s Day; “You may have riches and wealth untold, baskets of silver and bushels of Gold. . . but richer than I you shall never be, For I had a Mother who Read to me!” ~ Thomas Carlisle The students would write a story, illustrate and bind it and present it w/ this as their Forword to their Moms; Homerun!! I am so grateful for this excellently written post, Kate! Good readers make good writers!